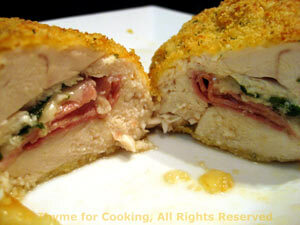 Thyme for Cooking Menus: Chicken Breasts stuffed with Ham, easy recipes. One of our last oven dinners for the season, but with a hint of spring. A wee break while the potatoes and chicken cook, then do the snow peas at the last minute. A mandolin makes quick work of slicing the potatoes but is not necessary. Clarifying the butter is not difficult, just a bit fussy. Try to make the first layer as neat as you can. 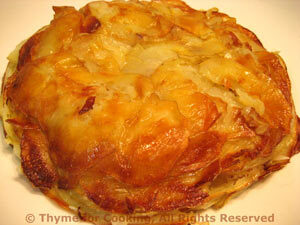 Remember this will be the lovely, golden brown top when you unmold the Pommes Anna. This is enough for 2 meals or 4 persons. 4 medium potatoes, 24oz, 720gr, peeling optional (I don't bother but purists would be appalled). Clarify butter: Melt butter in a small pan over low heat just so that it is melted. You will notice the white milk solids in the butter. We don't want these. With a small spoon skim off as much of the floating milk solids as you can. Then carefully pour the clear (mostly) butter into a glass measuring cup, leaving behind the remaining solids. Using a basting brush and some of the clarified butter, generously butter the inside of a round, glass baking dish. Mine is about 8" (20cm) in diameter and the potatoes will come up about 2/3's to the top. Slice the potatoes into paper thin slices, using a mandolin, box slicer, food processor, or a sharp knife. Line the bottom of the baking dish with a layer of potato, brush very lightly with butter. Add a layer of potato, brush with butter. Repeat until you have used all of the potatoes. If you use salt & pepper put a little on the middle and top layers. Cover with a lid or foil and bake in 400F (200C) oven for 60 minutes. Remove, and let rest for 5 - 10 minutes. Slice half of the Pommes Anna into wedges and serve. Save the other half for another meal. 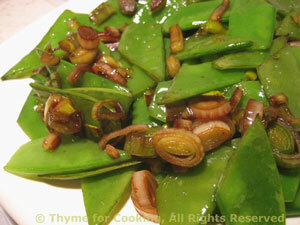 The quintessential spring dish: snow peas and green garlic. If the snow peas are small, leave them whole. If they are large (2", 5cm) cut in half of thirds, at an angle. Peel and slice green garlic, using as much green as you can. Heat butter and oil in nonstick skillet over medium heat. Add sherry, green garlic, pea pods and sauté 5 - 7 minutes, depending on size, stirring frequently.